MONTPELIER -- A lot of restaurateurs in this city learn their trade at either the New England Culinary Institute or the nearby ice cream empire, Ben & Jerry's. Pamela Root, the owner-chef of That's Life Soup, worked at Ben & Jerry's for 15 years, but on the business side, dealing with distributors and manufacturers. She hadn't made her living cooking since doing catering nearly two decades ago. So what made her decide to open this cozy, upscale version of a soup kitchen? During her Ben & Jerry's days, Root says, "I wanted to get good soup, so every Sunday I'd make a big pot." Friends kept telling her she ought to be doing it for a living, and eventually she heeded their advice. She took over a former office space, recast it as a 24-seat cafe, with decor inspired by her love of the Arts & Crafts movement, and opened That's Life last August. On the menu are salads and grilled sandwiches, including something great called Zephyr's and Jan's creation, a concoction of Monterey Jack cheese, pesto spread, and a tapenade made of black olives, red pepper, zucchini, tomatoes, capers, and garlic. But the main attraction is Root's soups, with servings not for the faint of heart. The small portion, filling a 12-ounce bowl, is bigger than a large in most places. "When this one couple first came in, they said, 'Pam, your small soup is too big!' " she says. "Now they come in, each one orders a large, and they eat the whole thing." There are usually four soups to choose from. On this day options include beef braised in red wine with wild rice, carrots and onions; a spicy black bean simmered in vegetable stock with tomatoes, onion, and garlic; vegetable herb chowder with cheddar cheese; and classic split pea with ham. Root, who is in the kitchen cooking every morning, serves 10 to 12 soups every week. Some barely last through one day's lunch. 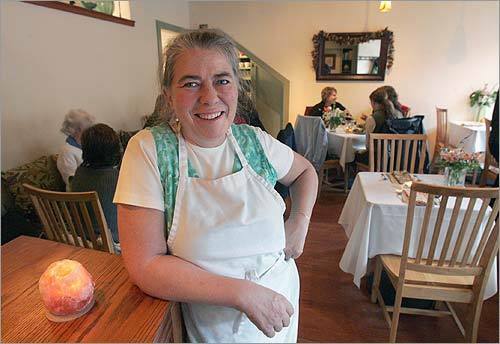 She operates as a combination cook, earth mother, and small - town doctor, whether it's opening the door after the restaurant is closed to serve a hungry pair, or making sure there are plenty of gluten-free, lactose-free, or vegetarian offerings. "I try to say on the menu what the ingredients are, so people can pick and choose," she explains. "There are a lot of people around with lactose intolerance and celiac disease [requiring a gluten-free diet]. So I'm always looking for recipes those people can eat." And while she doesn't do home deliveries, she does make house calls -- by phone, at least. After being open a few months, customers began asking to be called to let them know what day their favorite soup would be on the menu. "I've got about 10 right now I have to call for Greek lemon and chicken soup with orzo," she says, "and there are the people for lentil with chorizo sausage. They're both on my greatest hits list." Among other customer favorites are French carrot soup, sweet potato bisque with jalapeno lime cream, salmon chowder, Caribbean cod, "white" chili (made with chicken and four kinds of peppers), and mulligatawny. Root says she has more than 200 recipes she likes, but she's always searching for more. "Every week I probably have five new soups. Right now I'm looking for the best broccoli soup I can find." She also has recipes to celebrate various cultures, or holidays, whether it's lamb harira for Ramadan or matzo ball soup for Passover. But whatever the feast or tradition, the finished product has to be good. Making her own stock is one of the keys, Root says. Another trick is knowing not just what ingredients to use, but how and when to add them. "Say you want to have a little natural sweetness. You want to have the aromatic vegetables like carrots and onions sweat, or caramelize the onions, to bring out the natural sweetness. Or if you're using hot pepper, how hot it is depends on when you put it in. If you add it when you're sautéing vegetables, then the heat's a little mellower." Root tests her recipes on customers. She also tests her customers, posting questions on the wall that elicit a free bowl of soup for the right answer. "I had a Basque soup and wrote the title in Basque, and said anybody who can translate this gets a bowl of soup. One man came up with a translation that was so fantastic -- it wasn't right, but it was so good I gave him a free bowl anyway." She's generous with the freebies: As far as she's concerned, it only helps the bottom line. "I learned that from Ben & Jerry's: The best form of marketing is to taste the products." There's just one problem for the weekend visitor: That's Life is open on weekdays only, though Root is thinking about changing that. In the meantime, wander by on the weekend, just in case. "Occasionally when I'm here on Saturday," she says, "I'll open the door and invite people in and serve them." Kathy Shorr, a freelance writer on Cape Cod, can be reached at kshorr@mail2.gis.net.